This month we're showing off Leopard Print. Until the start of this year I owned one or two things Leopard print which one was a belt and I think I've had some ballet pumps from primark, although I might have dreamt that! A shopping trip to Doncaster in January saw me buy a leopard print dress and from there i've got a skirt and the latest edition is this dress which is from Tesco. The texture and fabric of this dress is a little odd, it has a slight fuzzy felt like texture but it's really soft and warm but not over heating! This last photo isn't very flattering but makes me laugh. I have no real issue with my VBO but as the day goes on I notice it getting bigger and more bloated, this picture was taken when I got home from work and it almost looks like i've got a spacehopper up mi' frock! It tickled me any road! I love leopard print. I used to worry that I was going the way of Pat Butcher, but now I embrace the bling! 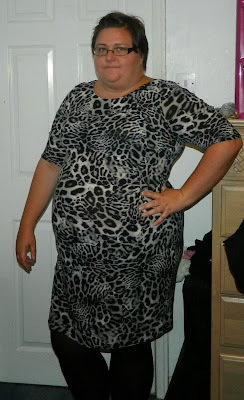 I love a bit of leopard print! 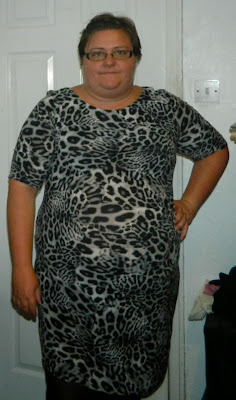 aww i wish i was brave enough for leopard print. too self conscious is my problem. you look lovely.